Choi Soon-sil, center left wearing black hat, a cult leader's daughter with a decades-long connection to President Park Geun-hye, is surrounded by prosecutor's officers and media at the Seoul Central District Prosecutors' Office in Seoul, South Korea, Oct. 31, 2016. South Korean President Park Geun-hye has vowed not to let a growing political crisis of confidence in her administration undermine the nation’s national security. Amid the political turmoil the South Korean military this week began its annual Hoguk exercise involving the Army, Navy and Air Force. However, revelations regarding an influence-peddling scandal involving a longtime friend of the president have seriously damaged Park’s hold on power and credibility with the public. Over the weekend Park fired many key senior officials and advisors in response to massive public protests and increasing calls for her resignation or impeachment. Choi Soon-sil, the shadowy figure at the heart of the presidential scandal returned to Seoul from Germany on Sunday, where she and her daughter fled in September when reports of misconduct first surfaced. Her lawyer, Lee Kyung-jae, said Choi “is deeply remorseful that she had caused frustration and despondency among the public." Park’s relationship with Choi dates back to the 1970s, during the time her father Park Chung-hee ruled South Korea for 18 years after coming to power in a coup. Choi’s father Choi Tae-min, a religious cult leader, became a mentor to Park while she was acting as first lady, after her mother was killed during an assassination attempt on her father. The two women also became close friends during this period when they were both in their 20s. 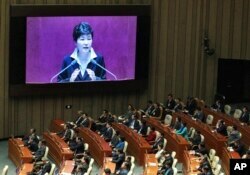 FILE - South Korean President Park Geun-hye, shown on a large screen, delivers a speech at the National Assembly in Seoul, South Korea, Oct. 24, 2016. Choi is alleged to have exercised not just influence but “cult-like” control over President Park, even though she had no official government role, and to have exploited her personal relationship with the president to coerce large corporations to donate over $68 million, which she then embezzled. Choi, who has denied the allegations of wrongdoing, met with prosecutors on Monday. "I am so sorry," 60-year old Choi Soon-sil told reporters before the meeting. "I have committed an unpardonable crime." The disclosures have shattered Park’s image as an incorruptible leader, a reputation that was reinforced by the fact that she is unmarried, estranged from her siblings and had until now no public ties to disreputable figures. “With this scandal what we are seeing is that the president is being accused of basically being the puppet of a single person, or rather a single family, that she has done extensive things only for their own benefit and not for her own, at least to the public’s knowledge,” said Koo Se-wong, the editor of Korea Expose, an online Korean news and opinion site. Government documents found in a discarded computer tablet indicate Choi received confidential information on Japan and North Korea, raising concerns that she had undue influence over formulating national security policy. There are allegations that Choi was influential in setting Park’s hardline positions to reject any engagement with North Korea, to close the jointly run Kaseong industrial complex after the North’s nuclear test in January, and to agree to deploy the American THAAD missile shield over the objections of Beijing. Choi had reportedly said she believed North Korea would collapse based on spirits that spoke to her. Analyst Bong Young-shik with the Yonsei University Institute for North Korean Studies says Park’s association with Choi seriously undermines her ability to advocate for further international sanctions against the Kim Jong Un government or increased deterrence at home. “Unless those accusations will be cleared, then the Park Geun-hye administration will not have sufficient political capability to engage in North Korea policy. It will just remain an uncertain, chaotic state,” said Bong. 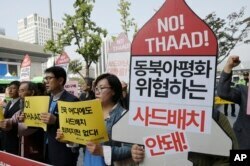 FILE - South Korean protesters shout slogans during a rally to oppose a plan to deploy an advanced U.S. missile defense system called Terminal High-Altitude Area Defense, or THAAD, near the U.S. Embassy in Seoul, South Korea, Oct. 20, 2016. President Park’s efforts to extricate herself from this crisis by apologizing and firing officials that may have facilitated Choi’s involvement have not eased public outrage. Park's approval ratings have plummeted in the wake of the scandal. At the same time, it will be difficult to force President Park from office before her term ends in 2018. Park’s ruling Saenuri Party may ask her to leave the party to dissociate itself from the scandal. However her supporters in the National Assembly would likely try to prevent the opposition from mounting an impeachment trial that would bring out more damaging publicity. However Kim Jae-chun, a political science professor at Sogang University in Seoul, says Park’s ability to govern has been seriously compromised, perhaps irreversibly so. “As it is impossible for the President to lead a policy, it seems difficult to start a new policy on domestic as well as diplomatic policies,” said Kim. Moving forward the best that Park can hope for, says Kim, is to be a caretaker to protect the present policies in place. Youmi Kim and Han Sang-mi in Seoul contributed to this report.